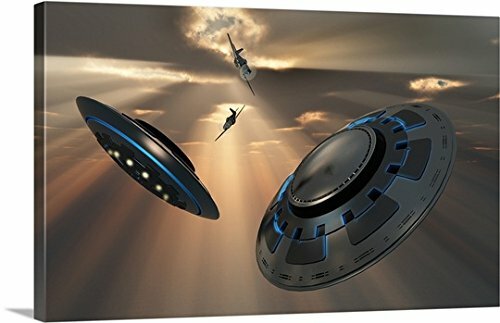 Gallery-Wrapped Canvas entitled 'UFO's and fighter planes in the skies over Roswell, New Mexico'. A 3D conceptual image illustrating UFO's and fighter planes in the skies over Roswell, New Mexico. In July 1947 it was reported that an extraterrestrial flying saucer had crashed at a place known as Roswell, New Mexico, USA. Conspiracy and denials have come and gone ever since. Multiple sizes available. Primary colors within this image include: Peach, Gray, Dark Navy Blue. Made in the USA. Satisfaction guaranteed. Archival-quality UV-resistant inks. Canvases have a UVB protection built in to protect against fading and moisture and are designed to last for over 100 years. Canvas frames are built with farmed or reclaimed domestic (pine or poplar) wood.